Garlic chive is not a cultivar of ordinary chives but a distinct species of plant. It is commonly regarded as a major kitchen herb, tasting—as its name suggests—like chives with a mild addition of garlic flavor. It looks like and is grown very much like ordinary chives. Note that in Chinese cuisine, the flowerheads of garlic chives are considered a delicacy. There are at least some recognized cultivars, though few or none are identified as such in seedsmen’s catalogues (one is a variant with pink, instead of white, flowers). You pretty much get “garlic chives” and that’s all she wrote. Garlic chives sprout easily from seed, after which they can easily be propagated vegetatively by clump division—or you can cut the cackle and just buy a plant (they are Perennials). They are said to prefer a sunny position in a rich, moist, but well-drained soil, but are also said to be quite forgiving of adverse conditions. If you’re considering growing them in-ground, beware: they are invasive, and pulling them can become quite a tedious chore. Indoors in a pot is best. Garlic chives generally like moist (but not soggy) soil. During their first season, hold down watering to encourage root growth. Garlic chives tolerate heavy harvesting. 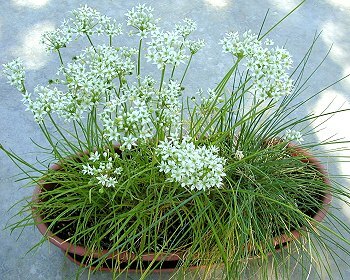 You can treat it like ordinary chives, pinching off any flower buds that appear, or you can let it flower in the autumn, as the buds and flowers are every bit as tasty and edible as the leaves. Harvest leaves by cutting some, or even all, being sure though to cut close to the soil level, so the plant “knows” to send up new leaves. If your garlic chives plant seems to be getting woody, prune it all down to about an inch above the soil level. It is wise to re-divide one’s garlic chives every few years, to maintain plant vigor. Division can be done almost anytime, but is probably best done in spring. It was last modified on Monday, 4 February 2019, at 03:37 EST.